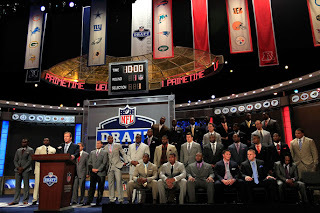 With the future of the NFL hanging in the balance for well over a month, the 2011 Draft figured to be unlike any in the history of the league. 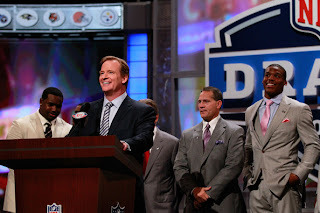 And while most people were focusing on the affect that the lockout had on every team and player who weren't able to proceed with business as usual, Roger Goodell found himself in a very interesting position as the draft got underway. Ever since ESPN (and more recently the NFL Network) realized that the Draft was something the average fan cared about, it has become one of the most anticipated days of the NFL calendar year. With the growing popularity of the draft, the NFL decided to move the first round from Saturday afternoon to prime time on Thursday night in order to better capitalize on the ever expanding demand for all things football amongst their fan base. As he has in years past, the commissioner took on the familiar role as the master of ceremonies throughout the first round where he usually receives a lukewarm greeting from a couple thousand fans that care a lot more about who their favorite team is going to draft than the guy standing at the podium. But the greeting Roger Goodell received at the 2011 NFL Draft, although it was pretty much expected, was anything but ordinary. The most powerful man in the NFL who was kicking off one of the most celebrated events of the NFL season was booed vociferously by some of the most loyal members of his fan base. Having attended the event in person on Thursday night, I was lucky enough to get a front row seat to what had to be a very humbling experience for Roger Goodell. When I arrived at Radio City at around 6:30, I was shocked to see none other than Goodell shaking hands, taking pictures, and signing autographs for the fans waiting on line. Besides the fact that he was wearing a suit that cost more than anything I own, he came off as a regular guy who knew the people that fund his business were pissed off and had every right to be. He didn't have an intense presence about him like a lot of people say celebrities do in person (I'm using the term celebrity loosely here), and he really seemed more vulnerable and genuine than anything else. No one on line booed him or really give him a hard time (although someone started a "we want Tagliabue" chant at one point) mostly because we were all surprised that the commissioner of the NFL, who is almost always in a position of power and is most well known for disciplining players that do something wrong, would actually take the time out of what had to be one of his busiest days of the year to meet with fans. 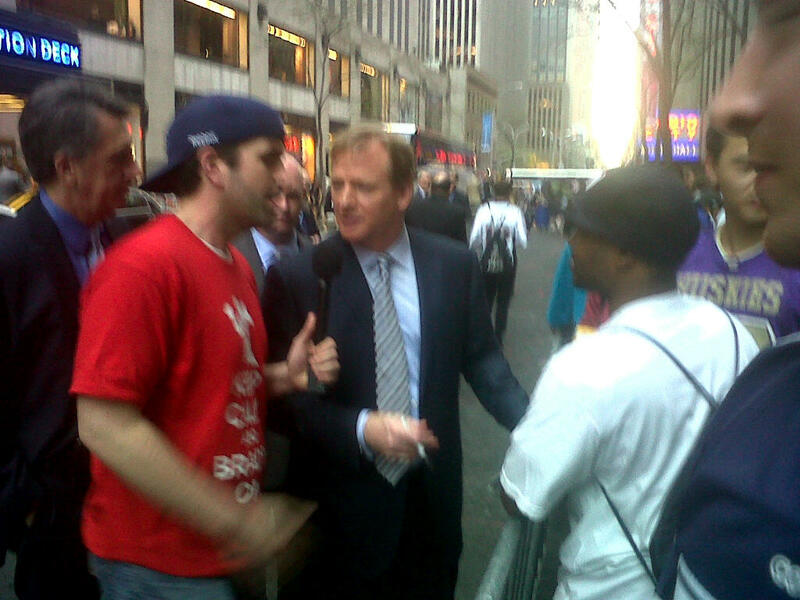 I'm sure the idea to send Goodell outside Radio City to shake a few hands before the draft was thought up by one of his PR people, but it says something about Goodell that he was willing to subject himself to hundreds of people who aren't very happy with him. Most people would agree that it's a part of his job as commissioner to deal with the good and bad from NFL fans, but I don't know if Bud Selig or David Stern would have done the same thing. After he took more pictures with random people and signed more autographs than he probably ever has in his life (I don't see the value of having a Roger Goodell autograph, but that's another story), Goodell was no doubt preparing himself for the less than positive reception he was going to receive on stage. And although he knew it was coming, there was nothing he could do once he got up on that stage to prevent the inevitability of getting booed on national television by the people who love his sport the most. Even before he reached the podium to signal the official start of the draft, the boos rained down on Goodell and for a few moments, arguably the most powerful man in professional sports was at the mercy of his fans. The boos and a "we want football chant" continued well into his speech and that moment was everything that shouldn't happen to a commissioner. Standing on that stage, Goodell looked more like a kid who just bombed at the high school talent show than one of the most powerful and important men in professional sports, and it showed. He was nervous, rattled, and had no control whatsoever over the crowd which made for one of the most awkward moments in NFL history. The image of Roger Goodell trying to kick off the NFL Draft with an "I don't know what else to do so I'm just going to smile" look on his face humanized him and it brought a man with an incredibly well respected title and position to his knees. If only for a few moments. On day two of the draft Goodell received a similar welcome to the stage, but having no doubt received some advice about how to control the crowd, he quickly ended what could have been another humbling moment on national television. I experienced a lot at the NFL Draft; just a few rows from where I was sitting, Brian Billick was for some reason mobbed like Justin Bieber at the Teen Choice Awards, Cam Newton walked right by me and I didn't even realize it, and a couple friends even spotted me on T.V., but the thing that will stick with me the most was what happened to Roger Goodell. Who, for one day, was humbled by the current situation that the NFL is facing, even if he got to wake up the next morning and have everything return to normal. Hopefully, fans of the NFL will be able to experience the same thing with the game they love at some point this summer.